Discussion in 'Readers Rides (SEAT)' started by dangerdave, Nov 9, 2018. Hi all, I thought the time was right to start up my own thread in the readers rides section. I started off my Seat ownership in 2012 with a very nice red Leon FR tdi 170. I did a lot to this, Milltek, remap to 215 ish, Bilstein, lowering springs and body kit. Then when it started getting a bit tired I traded in for one of those petrol 1.4 FR models brand new. This was a good car but it was on pcp and I never really considered it mine! Then this year I bought my Cupra 290 from the same dealership and I love it. I have good plans starting on the 19th of Nov 2018 !! Here though is a picture of it now. I am a big fan of Adam's Polishes for detailing and the car had just been finished. Here is a selection of my detailing products. The microfibre cloths and wash pad are superb. The car is going into Awesome gti on the 19th for a APR stage 1 remap and uprated clutch. They are fitting a new dogbone mount too. Also about to be ordered are Bilstein B14 Coilovers, APR rear anti roll bar, APR carbon fibre air intake kit, side skirts once I decide what I want, and a few engine bay billet fluid caps. When I can afford it again.. lol some new wheels either BBS or OZ will be on with Michelin Pilot Sport tyres. Oil will be Millers CFS Nanodrive. I will be adding to the post as work progresses. Thanks for looking. I have been invited to the meet in Blackpool in Jan so looking forward to meeting members.Cheers. 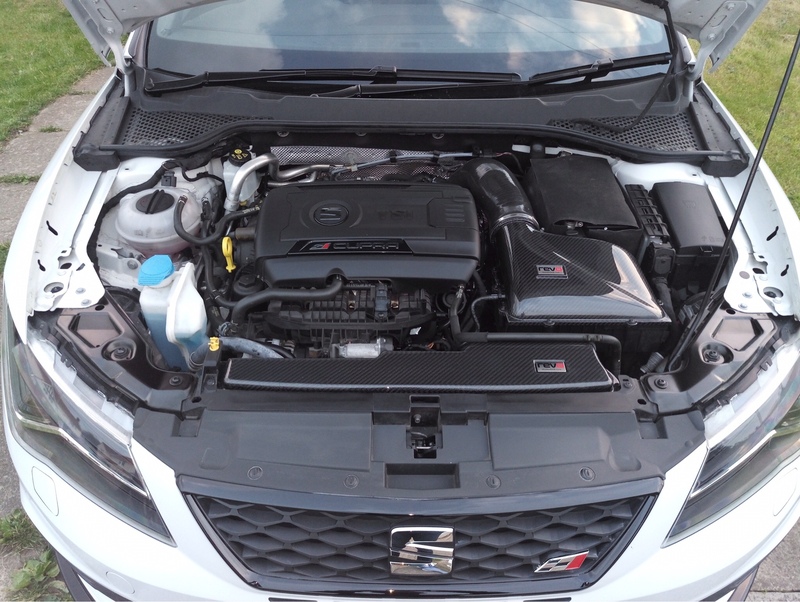 bigT's lcr, Maypack and cupra300uk like this. Welcome to the site and looking forward to seeing the car at the blackpool meet. Have you considered the Upgraded Boot struts or Bonnet ones as they do make a nice addition to the car. Thanks mate I will see you there. I've been looking at your car a lot. Always up for new stuff !! VCDS/OBD11/CARISTA are all gadgets that allow you to connect to your cars electrical systems and make changes to the setup of the car. They range from silly things like turning on Traffic Sign Recognittion (if you have the correct sensors) through to adjusting the way the brakes and LSD Work. Check out the link in my signature for OBD11 Resources and that will give you links to some stuff to give you an idea of what it can do. VCDS Is the Best (and most expensive) OBD11 Is my favorite and 2nd most expensive and you can use the VCDS Coding, Carista is an app that is good but you don't code it. It is an app that does all the work for you but is limited in that it only does what they have built. If you are an Apple phone man then Carista is the only one that supports it. That's what I like to see, straight to modding . Love the car, black looks awesome when polished up. What swayed you to the B14s? I've been trying to decide between the B14s, Pro Street S and K1s for about a year now LOL. Still can't make my mind up. Hi, the only reason I am going for the B14 is because the chap at Awesome Gti told me the best handling Cupra he had driven had them! Seems a reasonable advert, or very good marketing haha, I would get them to fit and set up and am looking at around 30mm lowering. Thanks I will certainly take a look at your thread ! Haha, fair enough. You'll have to give me your verdict on them though when they are on. I don't know why I read these threads... it just makes me spend more money lol the physical mods I don't mind it's when someone says oh these detailing products are superb.. that hurts my bank balance haha damn you @dangerdave. Your telling me! I'm currently pricing up B14s!! That detail spray is good. I spray it all over the wet car after washing then dry it all off together. The one thing that bothers me though about my car - you have it all dry and polished and every 10 minutes some water runs out of the mirror base and leaves a line !!! you have it all dry and polished and every 10 minutes some water runs out of the mirror base and leaves a line !!! Boot for me. No matter what I do, I always walk round the back of the car to see a single stream of water running from the boot down the bumper. Same lol I dry the boot first then open it and dry the rest of the car and then do another sweep over the boot... seems to work for me. Also stick a microfibre up near the reg lights for a little bit. Trip to Awesome GTi yesterday for more goodies. Fitting time soon! theoldboy, Maypack and Deano j1971 like this. You can’t go wrong with a nice piece of carbon even though you can’t see it, does that one make some noise. I have the revo carbon series intake system which is a closed box but doesn’t make much noise at all. Hi. I hope it won't make much noise to be honest. When I had my 2.0 tdi FR I had an open cone filter kit and all the huffing and puffing it did rattled my head in. It was just wierd!! Well folks I had 2 hours yesterday to spare before the sun went down over the horizon so I thought I would tackle the APR job. Using the downloaded instructions I removed all the stock air intake and added the carbon parts. The job was easy and done in 1 hour. Intake box and pipe clamped up loose to check. I need to clean that alloy valve thing in the picture!! That screen wash cap will have to go!! This is the only thing I don't like much. When the original plastic parts are removed it leaves a somewhat untidy area open to view. I will be thinking of some mod to make that look better. See above pic. Once I was happy with the fit I nipped up the hose clamps and fixing screws. Taking the car out for a run on wet roads I didn't notice any extra noise which suits me! A decent mod. Just need to fill that gap. Maybe I could get a scrap air intake from another car, cut it down and wrap it in decent CF? Looks good man... need to take it out in the dry and open her up a bit to see if there is much noise just to satisfy yourself. Again looks good,nice mod.